Ian Johansen, a 2006 member of Jersey Surf, sent this picture. This picture was taken by Kirstin Schrier. 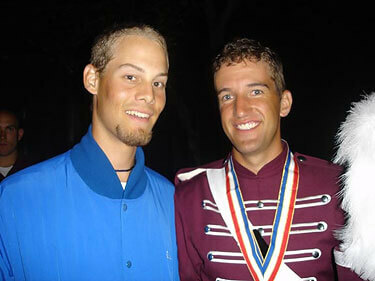 From left to right: Ian Johansen (Jersey Surf, 2006) and John Connelly (Jersey Surf, 2002; The Cadets, 2005-2006). John and I played trumpet together in high school when I was a freshman and he was a senior. He was always an inspiration to me to want to play the trumpet and to march in a drum corps. We met up in Madison this year after the Division I World Championship by the Cadets' equipment truck. It was awesome that we were able to get this picture because I had just finished my first summer marching in a drum corps and he had just marched in his last.